You may have heard it said, "We're here for the kids... not the teachers." You may have even said it. It's true. We are here for the kids. Students are the reason that schools exist, and every decision should be driven by the needs and interests of the children. However, don't make the mistake of thinking that student needs and teachers interests are mutually exclusive propositions. I would actually argue that they are inextricably linked. To put it simply, happy teachers are more effective teachers. In fact, the morale of your faculty is an important component of a strong school culture. 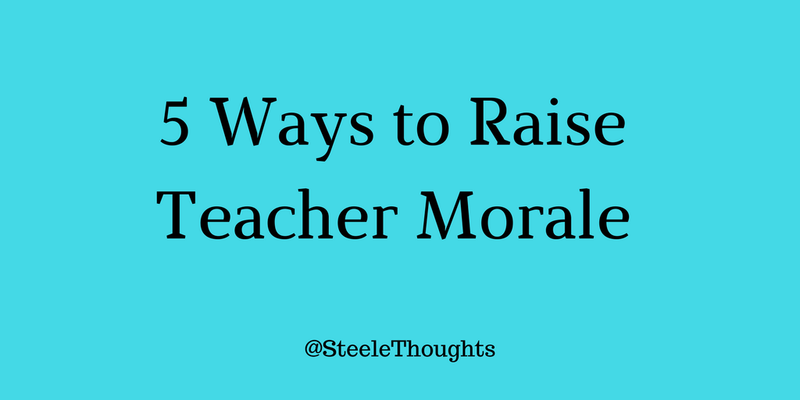 Here's the good news: it's not that hard to raise the morale of your teachers! But it usually doesn't happen by accident; you must be intentional about it. Keep your teachers focused on the difference they are making for kids. Being a teacher is a profoundly gratifying career. It's easy to get bogged down in the administrivia, though. The daily grind of planning lessons, grading papers, and dealing with the knuckleheads can sap the energy and joy from teachers. We need to remind our teachers why we come to work each day. We keep the focus on our students and not the "hassles" of the job. We remind our teachers about the difference that they make in the lives of their students. Our teachers are heroes in the classroom every day, and we never want to overlook that. When we help teachers keep their eye on the ball, they are more likely to keep their head in the game. When teachers remember their "why," it can carry them through the stresses of their day. Involve your teachers in the decisions of the school. In my experience, teachers are more motivated when their administration leads collaboratively. When teachers are involved in the decisions of the school, they are more invested in the process. When their opinions are valued, they feel valued. Listen to the feedback of your teachers... and take it seriously. When teachers feel included in the decision making process, they will take ownership of the entire school, not just their classroom. Trust the judgment of your teachers. Teachers are professionals. Treat them like professionals. Respect their experiences, and respect their expertise. I realize that principals are responsible for the entire school and are ultimately accountable for everything that happens. But micromanagement is the quickest way to destroy the morale of a faculty. Give your teachers an opportunity to prove themselves. Good leaders will quickly learn which staff members require closer supervision. Give your teachers the benefit of the doubt. Trust is foundational to any healthy school culture. When you are frustrated with something a teacher said or did, assume that they had good intentions. Don't start off being judgmental. When your default setting is to give teachers the benefit of the doubt, it will not go unnoticed. Your teachers will feel supported, respected, and valued. Notice the little things your teachers do... and recognize them for it. Praise your teachers often. Give them shout outs in front of their colleagues. Thank them for the little things they do that make a difference for their students, for their colleagues, and for the school. Be specific, and be genuine. Never take your teachers, or the important work they do, for granted. As teacher morale increases, so will the positive energy in the building. Students will notice it; parents will notice it; and anyone who visits the building will notice it. In my world, there is never a time when teacher morale is irrelevant. I strongly believe that teachers who feel good about coming to work and who feel good about the work they do, will be more effective employees. They will bring a higher level of energy into the their classroom, and they will demonstrate greater resiliency when confronted with adversity. And the kids will benefit! It is a rare administrator who truly gets this. Thank you for your commitment to our children AND our teachers. I hope my son will be able to experience your incredible school later this year. Thank you for reading my post... and for your kind words. I work with some wonderful adults who make it easy to build a strong culture. Clearly stated, relevant and accurate. I'm glad I read this. Throughout my career I have had many more ed leaders who emulate this than less, but I have had experiences long ago that make me appreciate them for it. Also, morale is easier to maintain than to fix, always. Judy... thank you so much for reading my blog, and for your kind words! I agree with this completely and rarely do administrators take the time to do the little things! I love the fact that you "get " it! Yes,we are here for the kids, but if I feel ineffective, unsupported and alone, how will I help my kids? Just like the student that comes from chaos at home, if we have chaos on our campus, we cannot do the work at school for the kids! I have served under the leadership qualities described in your blog. It was certainly easier to give my students my absolute best under their leadership. Your faculty is blessed to have you. Thanks for your inspirational posts and thoughts. You have written it so beautifully. I think this is something which would actually encourage the students to move forward towards their goal. What a great advice. Thank you for sharing! I liked your way to express your thoughts here. 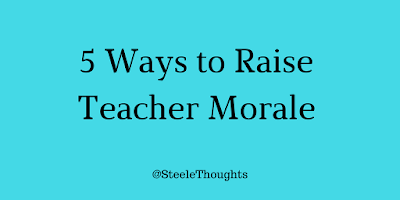 This article provides the great tips for raising the teacher morals. If anyone looking for the Revision help tutor South Korea, visit Top Tip Tutors.